The role media plays to express, influence and consequently mold the public perception about various issues is unprecedented. There are grave consequences for both the media and the youth in a society increasingly controlled and managed through the news channels. Today, everyone is spending more time in watching TV news channels. The programs on the news channels influence our decision process and shape our perceptions of the world. And It is impossible to escape the pervading impact of these news channels. Alternative Facts is a performance to shed some light on the other side of any story. Together, we will experience the difference between a piece of news and facts. The report tells us that more Syrian refugees than not are part of some terrorist groups, the truth is not quite that. The American news channels promote freedom of speech and equal coverage on all stories, and the fact is that no one talks about African American rights and, for example, how Lynching is just as bad as any other mass-murder case. 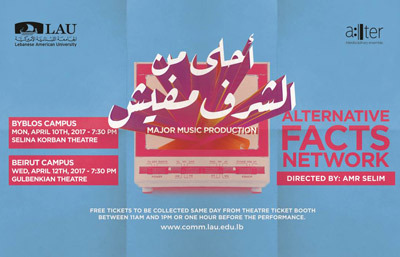 “Alternative Facts” is a blend of Arabic and Western music to reflect the treatment of Arab-related news by the western media, it is also a mixture of music, singing, spoken word, dancing and acting to reflect the power of image and illustration.